The short side returns to Planet Rugby as we study the main talking points ahead of this weekend’s action in the Champions Cup and Challenge Cup. Edinburgh’s encounter with Montpellier is also an interesting match-up and pits the top-two teams in Pool 5 against each other, but you can’t really beat a crucial Round 6 European clash at Thomond Park. Munster are clearly favourites and, realistically, only need a losing bonus-point but Exeter will be dangerous opponents. The Chiefs, by their own admission, have underperformed in the Champions Cup, but they are clearly focused for this encounter. Rob Baxter’s men were impressive against Castres and, despite having a shorter time to prepare, will no doubt come out firing in Limerick, looking to improve on their last result versus the province. After making a quicker than expected recovery from a hamstring injury, the Ireland centre should line up against Wasps on Saturday. Henshaw returned to training last week but wasn’t considered against Toulouse, so this could be his comeback game. With the Six Nations just a couple of weeks away and Joe Schmidt having a plethora of options at his disposal, this is a big match for the Leinsterman, who will need to prove his fitness after being named in the squad for the opening two rounds of the annual international competition. Richard Cockerill’s men have been a revelation in the Champions Cup this season and they showed their qualities in an impressive 28-17 triumph at the Stade Mayol last weekend. The Scottish outfit follow that up with a game against another French team, but this encounter is even more important. Edinburgh are in a good position to qualify and they are going in search of a home quarter-final after their good work in the previous five rounds. However, Montpellier could ruin the evening by claiming a win and overtaking the PRO14 team, which would be cruel on Cockerill’s charges. They may qualify regardless as one of the best runners-up but, as Edinburgh’s official website has said, it is a winner-takes-all clash. Two excellent full-backs should go head-to-head on Saturday when Saracens take on Glasgow. Goode is arguably the form player in England but has not been recognised for his string of excellent performances with a call-up to the national team. That has surprised many and no doubt this is another opportunity for the Sarries back to send a message to Eddie Jones. Hogg, meanwhile, will look to find his best form with the Six Nations not far away having just returned from a short-term hip injury. They are very different players, with Goode more of a creative threat in terms of his ability to come into first or second receiver and distribute, while Hogg is a better running weapon with his pace, balance and footwork. It should be a thriller. Fancy footwork from the full-back and Ben Spencer is in to wrap things up for @Saracens! 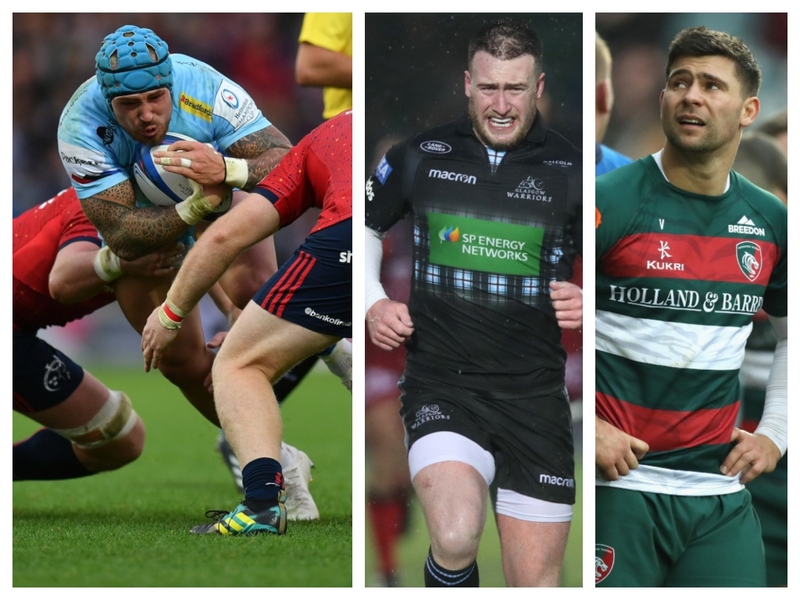 It has been another awful year for the English sides in the Champions Cup and they could, as Loose Pass noticed, finish the round robin stage with four of them at the bottom of their respective groups. In Pool 1, Wasps are guaranteed to end up at the basement, while Gloucester, Leicester Tigers and Newcastle Falcons are under threat. The Cherry and Whites will struggle away at Castres and Leicester have a tough game at home to Ulster, who are looking to secure their place in the quarter-finals. That leaves Newcastle, who will fancy their chances against a struggling Toulon, but the Tynesiders have faltered this season and the Frenchmen have plenty of talent in their ranks. Munster’s clash against Exeter Chiefs and Edinburgh’s match at home to Montpellier are the main games but Saracens v Glasgow is arguably an encounter which rivals those two contests. Elsewhere, the sides who have qualification aspirations are mainly facing teams out of the competition, with Ulster heading to Leicester, Racing 92 hosting Scarlets, Leinster taking on Wasps and Toulouse facing Bath. In the Challenge Cup, Pool 3 is an interesting group with Sale Sharks and Connacht level on points going into the final round. Sale are favourites to top the pool, however, with them going head-to-head with Perpignan, who are winless in the competition, while the Irish province have to go to Bordeaux-Begles, which could be a tough match. Pool 5 is similarly intriguing as Harlequins and Benetton head to France to face Agen and Grenoble respectively.